It’s difficult so say why this visit took so many years to arrange. I’ve been in contact with David for more than a dozen years, and Taunton is not continents away from London. It would be transparent to say that the busy city life makes it difficult to take a day away when taking a two week trip to South Africa is pretty much part of the essential annual pilgrimage. Sometimes, the more opportunities we have within easy reach the less inclined we are to take advantage of them. I’ll return to this later. 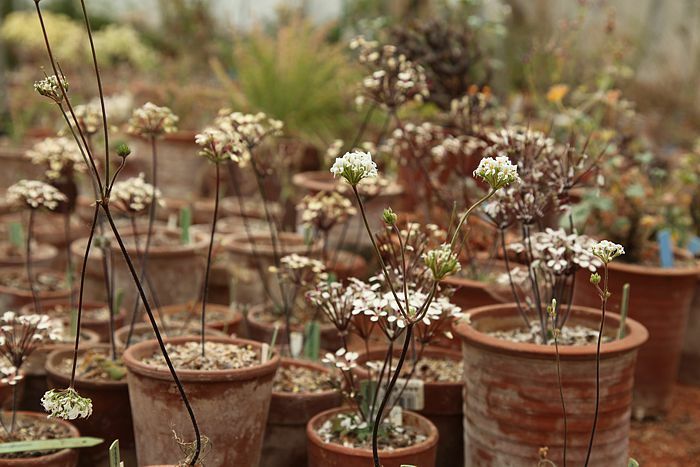 David Victor is well known to most pelargonium collectors, growers and researchers. 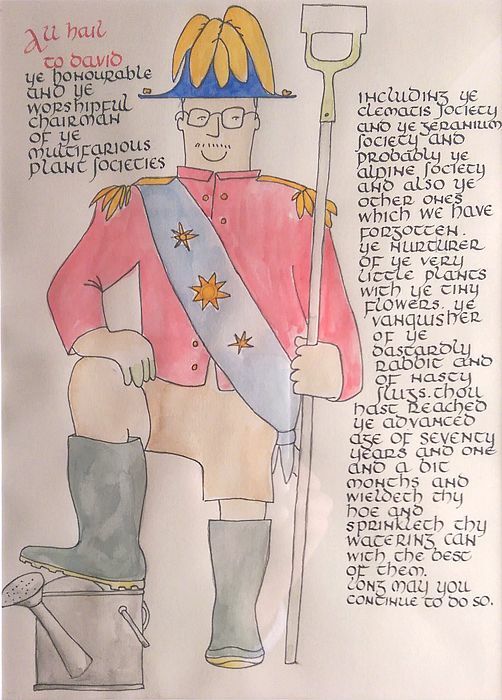 As the Editor of the Geraniaceae Group newsletter and a key member of this plant society, he’s been shaping the interests of many of us for long. Fig. 1: From the cottage to the pelargonium greenhouse, through a well-maintained cut flowers and vegetable garden. There is some serious gardening going on in Chapel Leigh. The travel from London to Taunton takes about two hours and a half by train. After a handshake we drive off to Chapel Leigh to his meticulously restored cottage. There is something about a properly laid out and weeded front garden that tells you tomes about the gardener: there is order and system in place, and gardening is not just a pastime but a serious business in this house. 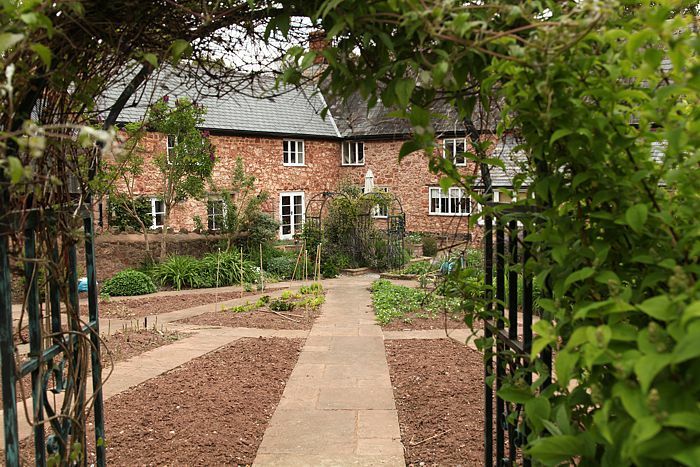 The formal back garden is equally fascinating, and while it reflects the many interests that David has in plants, it is a consistent and structured garden. It also reflects David’s hospitality: he is an interesting and talkative host. And properly knowledgeable. His interests in plants are extremely diverse: he has been collecting oxalis, peonies and bulbs for a very long time, and his interests switched to pelargoniums only comparatively late. He has travelled the globe to look at plants and recalls trips to China and Kazakhstan to look for peonies and tulips, one of which was a two-week riding and botanizing holiday! David has significant experience leading and managing plant societies. Inevitably, we start talking about their future. These societies have long been not just the place and the opportunity to meet and exchange knowledge and experience about plants, but also very social affairs. Meetings would often transform into social events where friendships formed, plants exchanged, and debates were fiercely conducted. Many societies struggle in the digital age when information seems to be within such easy reach, and social media brought about a revolution in communication. Whether this is to replace the social life that such societies enabled formerly, remains to be seen, however. Look at it this way: the very fact that I wanted to visit David and his collection, and many collections before, is a testament that social media cannot replace personal interaction. Has the fact that so much information is within our easy reach and freely available removed our need for plant societies? Is to develop a virtual community that cuts through geographic and social barriers (surely a positive thing), while at the same time combining this with the benefits of seed and plant exchange, peer-to-peer learning, as well as any other sort of human interaction, so difficult to achieve? Internet seems to be both an opportunity and a curse, and the struggle is not peculiar to plant societies I reckon. Fig. 3: The orderly Hoarea table, looking across the bed with Pelargonium section shrubs. At the end of the vegetable garden and through a thicket of peonies stands the greenhouse. Dorset has a peculiar climate: being closer to the Atlantic, it is wetter than London, and the particular location of the cottage at the bottom of a shallow valley means that winter cold accumulates around the house. Few pelargoniums would survive the winter if grown outdoors. In my London garden, P. peltatum, P. sidoides, P. lobatum, P. inquinans and P. alchemilloides and even a Hoarea section species, P. caledonicum, have survived several winters – the urban heat island has made this possible. 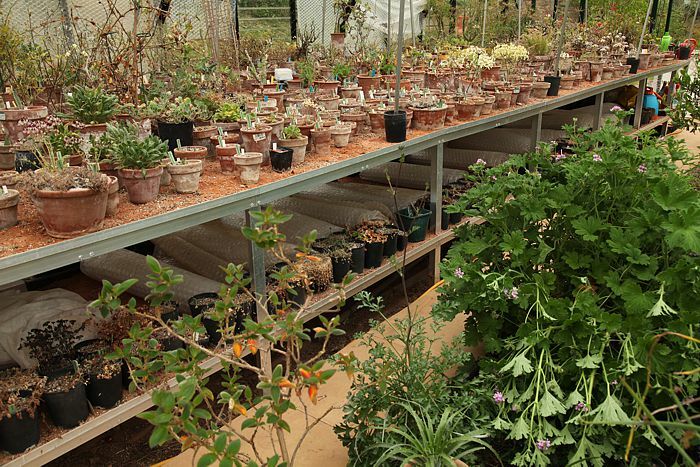 Not so in Dorset, where keeping plants in a heated greenhouse during wintertime is essential. We enter through a side door that takes us through a section of the greenhouse with pelargoniums growing in beds. The shrubby P. capitatum, P. cucculatum, P. caylae, P. papillionaceum are all in flower. It is very satisfying to see how well they grow given enough space. I truly like these large plants, many of which have very strongly scented leaves. Always being pressed for space it’s a difficult decision whether to grow a big and showy P. cucullatum or several modest species instead… Like David, I think I might also be developing a taste for the bigger shrubby plants (unfortunately). Fig. 4: A flowering P. auritum var. auritum on display. A little further back are several large tables arranged in sections. We start talking about the Otidia section that many truly like but few really understand. Inevitably, we spend some time discussing whether the latter is possible at all, given that many species and particularly subspecies tend to be fluid and well-defined only at the margins of their distribution. In addition, growth forms that we see in greenhouses are often so different to what we see in nature, that many plans that we grow cannot be identified unless one has a DNA sequencer readily available. Not many of us have this luxury at hand I guess. At this time of year, the Hoarea section was a truly outstanding part of the collection. At the peak of flowering season were P. auritum var. auritum, P. aridicola, P. moniliforme, P. oblongatum, P. vinaceum, and P. violiflorum. One of the most amazing plants was P. punctatum, an old and respectable plant with numerous flower stalks, each bearing several pseudanthia all in buds (Fig. 5). In early May, I was probably about two weeks too early to see this spectacular plant in full bloom. Fig. 5: A few weeks too early to see this impressive P. punctatum in full flower. We talked for quite a while about exciting recent developments in this section and the several new species that have recently been discovered. 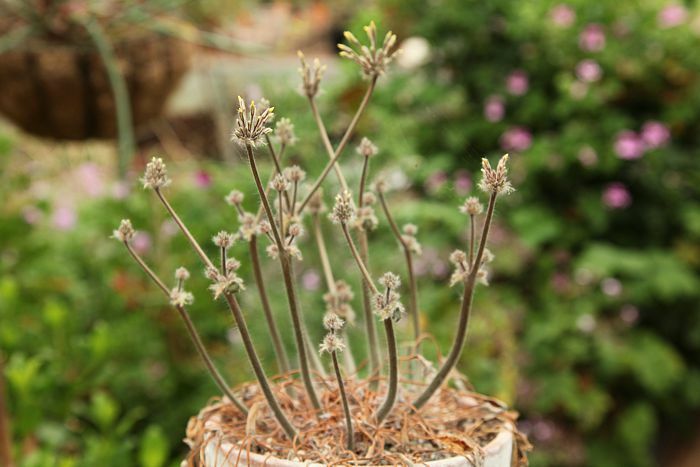 David is often sent such seeds and plants, also for the reason that his is a UK National Collection of Xerophytic Pelargoniums, one of over 630 national plant collections. A very fitting distinction given his unparalleled knowledge and skills as a plantsman. 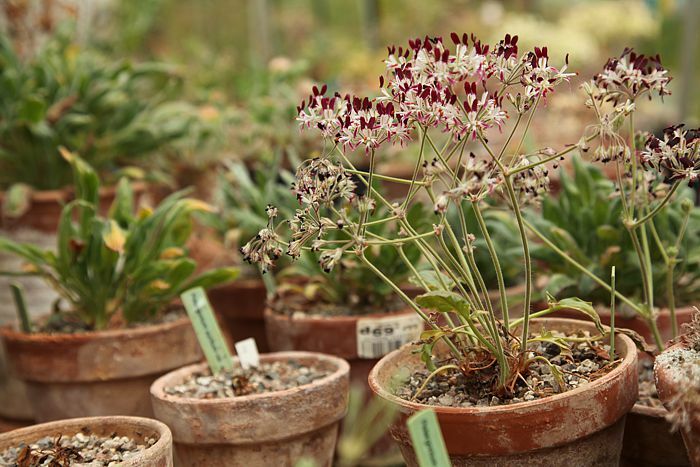 The title is awarded by Plant Heritage, sometimes after several years of inspection and discussion, and only for a collection that is well kept and documented. The title thus reflects the grower’s vision and skills, as well as ability to manage an exceptional collection for the benefit of all to visit, learn from and admire. Hint: do this in April to June as this is when many of his plants are in flower. Fig. 6: David explains what curating the National Collection means to him, and what the Geraniaceae Group can do for you. During his many travels to South Africa David has seen many of his species in nature. We discuss our recent travels as well as other attractions the country has to offer, which inevitably leads to us opening a bottle of red. Through all the years David made numerous friendships in South Africa: to study indigenous plants requires that we inform and are informed by local communities of enthusiasts and professional botanists alike. This way, pelargoniums can be understood better, make their way into gardens across the globe and be appreciated by more enthusiasts. It still puzzles me that most hybrids that are of exceptional economic importance come from only a handful of species, and there is a real potential to do more. It’s been a great day and too short indeed. I leave with a bag of cuttings and a strong impression that our friendship grew firmer. I guess this is one of the reasons why we grow pelargoniums and organise in plant societies. By Matija Strlic, Ljubljana, Slovenia. © The Author. This work is licensed under a Creative Commons Attribution-NonCommercial-ShareAlike 4.0 International License. Cite as: M. Strlič: Visit to UK National Collection of Xerophytic Pelargoniums, Pelargonium Notes, #5 (2017). What a great story and wonderful pictures. I hope to one day travel to S. Africa and also to London to the area located around David’s magnificent garden/greenhouse. These stories and pictures make me appreciate the club we all take part in. I hope the other sections are covered as time goes on. It would be neat if everyone sent in pictures of their collections more often. Hello Chris, many thanks for visiting and your comment! Matija.